JKatzWMF added a comment to T217883: Use the "Timeless" skin by default on frwiktionary. Congratulations to Noe and the other French Wiktionarians on your huge birthday!!! 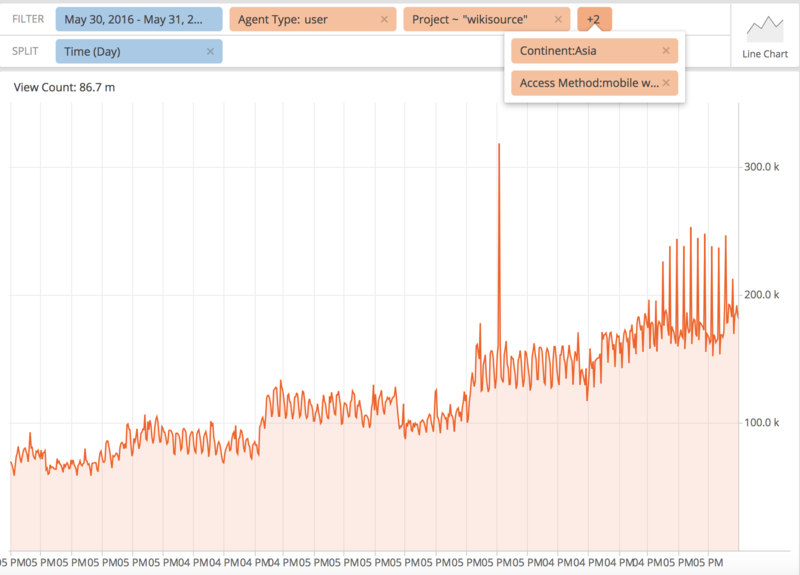 JKatzWMF added a comment to T214134: YoY mobile edit rates in mobile-heavy wiki segment. @nettrom_WMF @kzimmerman this is exactly what I needed. No more, no less and on time. Thanks! @kzimmerman @nettrom_WMF - no request here, just offering context for how the data will be used. I'll do the explaining. JKatzWMF added a comment to T211366: Android navigation refresh - understand impact on user engagement metrics. i saw in the ticket about the bug that hundreds of duplicate events were being sent. if there are hundreds, what % of total events is that? The data doesn't have to be perfect, so if it's less than 5% of events of any given event-type, then I wouldn't let it get in the way of analysis. JKatzWMF created T214134: YoY mobile edit rates in mobile-heavy wiki segment. • Jdlrobson awarded T142090: Add hover-card like summary (og:description) to open graph meta data printing plain summary a Love token. JKatzWMF added a comment to T210687: Bug: can't make a YoY time series chart in Superset. Yeah, I've only gotten it to work well by looking at 1 year and the previous year overlaid. I tried but have not been able to create a "periodicity pivot" chart (or learn what that means), but it sounds cool. JKatzWMF added a comment to T195880: % of "none" referers seems too high. @Nuria while bot detection certainly plays a role, I am nervous about classifying this as an issue that can be more or less fixed with better bot detection. Other sites have something like 5% of their external referrals coming from none + unknown (which includes direct) and we have 29% (in the last year). Our "referrals" from other sites is 14% of external traffic, for comparison. Even if 10% of TOTAL traffic was undetected bots (yikes), it wouldn't make up this difference. Also, the % of "none" traffic seems to be dropping over the last few years, while one would expect inflation over time of undetected bots (assuming a static bot definition). JKatzWMF created T211173: "Edit" equivalent of pageviews daily available to use in Turnilo and Superset. JKatzWMF renamed T195880: % of "none" referers seems too high from Problems with external referrals? to % of "none" referers seems too high. JKatzWMF set Due Date to Oct 23 2018, 7:00 AM on T207402: Provide analyst feedback on ideas from Editing team brainstorming. JKatzWMF updated subscribers of T205681: Metrics request on portal namespace usage. @AfroThundr3007730 Hi! I don't think we've crossed paths yet, but you are clearly very active on both the wikis and phab. I'm a director of product at the foundation and the interim manager for the product analytics team. Thanks for reaching out and for drafting such a well-thought out request. As you likely suspected, the team is incredibly overloaded right now: our current mandate is to provide guidance to the product development teams here at the Wikimedia Foundation, and all of them have unanswered questions and would like more support from us. JKatzWMF moved T202594: wmfdata package can be installed but not imported from Next Up to Backlog on the Product-Analytics board. JKatzWMF moved T198776: Set up data infrastructure for program metrics from Next Up to Blocked on the Product-Analytics board. JKatzWMF closed T198777: Pilot new editor retention and mobile new editor retention calculations as Declined. JKatzWMF closed T198777: Pilot new editor retention and mobile new editor retention calculations, a subtask of T198776: Set up data infrastructure for program metrics, as Declined. JKatzWMF moved T188391: Develop strategies and tools for segmenting wikis [2018-19 AP output 4.3] from Next Up to Backlog on the Product-Analytics board. JKatzWMF placed T188391: Develop strategies and tools for segmenting wikis [2018-19 AP output 4.3] up for grabs. JKatzWMF moved T188483: Wrap up documentation of New Editor Experiences research, workshops, and recommendations from Blocked to Backlog on the Product-Analytics board. JKatzWMF moved T188483: Wrap up documentation of New Editor Experiences research, workshops, and recommendations from Next Up to Blocked on the Product-Analytics board. JKatzWMF moved T206014: Mobile editors do not log loaded events from Triage to Tracking on the Product-Analytics board. JKatzWMF moved T205934: Change warning for events with no platform specified to exception from Triage to Tracking on the Product-Analytics board. JKatzWMF moved T206008: Many edit sessions have repeated pairs of load and ready events from Triage to Tracking on the Product-Analytics board. JKatzWMF moved T205940: Add change tag tables to monthly mediawiki_history sqoop from Triage to Tracking on the Product-Analytics board. JKatzWMF moved T205932: Create table of pre-Event Bus change tags from Triage to Blocked on the Product-Analytics board. JKatzWMF lowered the priority of T205932: Create table of pre-Event Bus change tags from High to Normal. JKatzWMF moved T206050: Mobile visual editor does not log saveFailure events from Stalled to Tracking on the Product-Analytics board. JKatzWMF moved T206050: Mobile visual editor does not log saveFailure events from Triage to Stalled on the Product-Analytics board. JKatzWMF moved T176023: Implement IE7 correction for long-term trend charts from Doing to Stalled on the Product-Analytics board. JKatzWMF moved T174976: Analyze Android feed activity from Doing to Stalled on the Product-Analytics board. JKatzWMF moved T152437: % of content read by % of people from Doing to Stalled on the Product-Analytics board. JKatzWMF added a comment to T205736: Requesting access to to analytics-search-users, statistics-privatedata-users for Chelsy Xie. JKatzWMF added a project to T190174: descriptive metric: traffic distribution: Research ideas. JKatzWMF lowered the priority of T190174: descriptive metric: traffic distribution from Normal to Low. JKatzWMF added a comment to T203216: Change dashboards using navtiming to navtiming2. @dr0ptp4kt Yes reading-platform was mine (As were reading-usertype, and reading-overview). Fine with me to delete. JKatzWMF added a comment to T199252: Search engines continue to link to JS-redirect destination after Wikipedia copyright protest. Great! Thank you for confirming, @Imarlier and, again, I am really excited to see this happen (and will be looking to track impact after rollout). I am really excited to see this ticket in play. I also want to double-check that we plan to tread cautiously here. Google easily represents the majority of our visits and anything that could change how they rank us needs to be thoroughly tested. JKatzWMF moved T148262: Vet and explore new readership engagement metric from Triage to Backlog on the Product-Analytics board. JKatzWMF moved T148263: Vet and explore new readership retention metric from Triage to Backlog on the Product-Analytics board. JKatzWMF reassigned T148262: Vet and explore new readership engagement metric from Zareenf to • Tbayer. JKatzWMF added a comment to T148263: Vet and explore new readership retention metric. JKatzWMF reassigned T148263: Vet and explore new readership retention metric from Zareenf to • Tbayer. JKatzWMF moved T148262: Vet and explore new readership engagement metric from Backlog to Triage on the Product-Analytics board. JKatzWMF moved T148263: Vet and explore new readership retention metric from Backlog to Triage on the Product-Analytics board. JKatzWMF moved T197986: Evaluate and Quantify the state of multilingual labels on Wikidata from Backlog to Next Up on the Product-Analytics board. JKatzWMF added a comment to T187590: Mobile readers location data. @Tbayer in phab review today we noticed this is in blocked. Can you add a note as to why? JKatzWMF assigned T199574: Improve formatting and data input for board health metrics to Neil_P._Quinn_WMF. JKatzWMF updated the task description for T193269: Onboard Morten Warncke-Wang to the Product Analytics team. JKatzWMF updated the task description for T194336: Get onboarded to the Product Analytics team. JKatzWMF moved T199726: Understand if ru.wikipedia main page changes had impact on mobile users from Triage to Next Up on the Product-Analytics board. JKatzWMF added a comment to T199726: Understand if ru.wikipedia main page changes had impact on mobile users. @atgo mentioned that replicating the queries from the previous analysis would be appropriate here. @atgo per @Tbayer's distinction above, can you confirm which of these tickets to use as a template? JKatzWMF closed T92444: Create a health dashboard for the iOS App as Declined. Hey we're working on cleaning up the analysts workboard. @JMinor given that this is a 3 year old task filed by Tomasz Finc, that nobody has touched in 2 years, I'm closing it. The idea of an iOS health dashboard is a good one, however. When you are ready to prioritize and specify a dashboard, we can create a new ticket. Obviously re-open if you feel this is the wrong approach. JKatzWMF moved T188390: Write a guide for product managers on possibilities and limitations for editor metrics from Blocked to Backlog on the Product-Analytics board. JKatzWMF moved T188390: Write a guide for product managers on possibilities and limitations for editor metrics from Next Up to Blocked on the Product-Analytics board. JKatzWMF created T199956: Placeholder: Answer PM question. JKatzWMF moved T192819: Event Logging schemas for Wikipedia iOS app from Doing to Tracking on the Product-Analytics board. JKatzWMF updated the task description for T198969: Ensure links on the mobile version of pages are not to the desktop version. JKatzWMF added a comment to T198976: Make it easier for search engines to index anchors on mobile. Hi @Nuria just following up on this to see if you have had a chance to take a look. JKatzWMF added a parent task for T198976: Make it easier for search engines to index anchors on mobile: T198970: Epic: Implement SEO improvements suggested by Go Fish Digital. JKatzWMF created T198976: Make it easier for search engines to index anchors on mobile. JKatzWMF moved T194336: Get onboarded to the Product Analytics team from Next Up to Blocked on the Product-Analytics board. JKatzWMF assigned T160492: Conduct further data quality checks on the ReadingDepth schema to • Tbayer. JKatzWMF assigned T173853: Calculate movement-wide contributor metrics using the Analytics Data Lake to Neil_P._Quinn_WMF. JKatzWMF updated subscribers of T197276: turnilo x axis improperly labeled. JKatzWMF created T197631: Add binary editor targeting to quick surveys tool. JKatzWMF created T197276: turnilo x axis improperly labeled. JKatzWMF moved T153856: Add lint/CI to all wikimedia/discovery analytics repositories from Triage to Backlog on the Product-Analytics board. JKatzWMF moved T182824: [epic] Show query-frequency-stratified results in A/B test results from Triage to Tracking on the Product-Analytics board. JKatzWMF triaged T196714: Update mobile app search metrics after multilingual update as Normal priority. JKatzWMF moved T196714: Update mobile app search metrics after multilingual update from Triage to Next Up on the Product-Analytics board. JKatzWMF moved T197138: [Epic] Improve search metrics and dashboards from Triage to Tracking on the Product-Analytics board. JKatzWMF moved T197174: Tag edits made in iOS app with an iOS-specific tag from Triage to Tracking on the Product-Analytics board. JKatzWMF moved T197175: Tag edits made in Android app with an Android-specific tag from Triage to Tracking on the Product-Analytics board. JKatzWMF added a comment to T47955: Provide a navigation option (next/previous/index page) for proofread page in mobile view. The numbers are still low, but something is happening. JKatzWMF updated the task description for T195880: % of "none" referers seems too high. JKatzWMF closed T196091: Investigate recent metamorphosis of unreferred views into internally referred views on mobile web as Resolved. JKatzWMF added a comment to T196091: Investigate recent metamorphosis of unreferred views into internally referred views on mobile web. chelsyx awarded T184677: Measure impact of Singapore data center on Wikimedia usage a Like token. JKatzWMF added a comment to T195819: Pageviews-daily broken after move from Pivot to Turnilo. @elukey it is, thank you for the speedy fix!! JKatzWMF added a comment to T154702: Fix broken referer categorization for visits from Safari browsers. @TheDJ Thanks for monitoring this and letting us know! It's a huge relief. JKatzWMF added a comment to T192893: Access to Google Search Console for Go Fish Digital. /me tiptoes away, embarrassed. Sorry, @RobH. Classic outsider move and I'll back off. Thanks for the additional work you're putting into standardizing this, as well. It is very much appreciated!! @RobH Just a friendly nudge, since I believe this is no longer "Awaiting user input" as the column on your board indicates (and is time-sensitive). Thanks! JKatzWMF added a comment to T177357: Metrics for SDoC: future work of interest (templates and licensing). @Ramsey-WMF we were just triaging this and were wondering what your timing was given that this was written as part of the first-round ask and you just finished a community discussion about this topic. JKatzWMF updated subscribers of T193505: AMC: Fix MobileWebMainMenuClickTracking schema for Minerva desktop to avoid errors. @ovasileva is a better judge of current use than me. I can't speak to the original intent, but I used it to gauge the popularity of the various features on the site, which seems like a valid thing to know. It doesn't change much though, so its not a very interesting dashboard. Its funny that you mention it though, because I was just complaining that we don't have a similar metric on desktop and therefore don't know how to trim the infamously lengthy left-hand nac. JKatzWMF created T190174: descriptive metric: traffic distribution. JKatzWMF updated the task description for T190113: Relationship between content and traffic by wiki. JKatzWMF added a comment to T188421: Investigate the full-text desktop search CTR decline on Wikimedia Commons. Thanks @chelsyx and congrats to @MNeisler on your first discovery! JKatzWMF added a comment to T172581: [EPIC] Set up mechanism for archiving Google Search Console data. JKatzWMF updated subscribers of T186760: Provide a feature flagged way for logged in users to disable mobile optimisations. @Jdlrobson interesting data collection approach and I like the framing you're using. Pinging @ovasileva and @CKoerner_WMF who are considering prelim information gathering options now. JKatzWMF added a comment to T185356: Requesting access to bast1001, stat1005, stat1006 for risler. JKatzWMF added a comment to T184838: Requesting access to stat1004, stat1005, stat1006 for mneisler. Approved. I hope my approval counts as Megan is supporting @chelsyx and I am Chelsy's manager. JKatzWMF updated subscribers of T184677: Measure impact of Singapore data center on Wikimedia usage. JKatzWMF added a comment to T184641: Metrics for Android quarterly update. Thanks for the quick turnaround @chelsyx! @Charlotte Just a heads up. hey we just saw this, and are not sure it can be delivered by Tuesday.